Your trampoline and your in-ground trampoline are so much fun, but what accessories should you get for your trampoline? There are many accessories that are simply for fun and those that will protect the trampoline and others that make it easier to get onto and off of your trampoline. 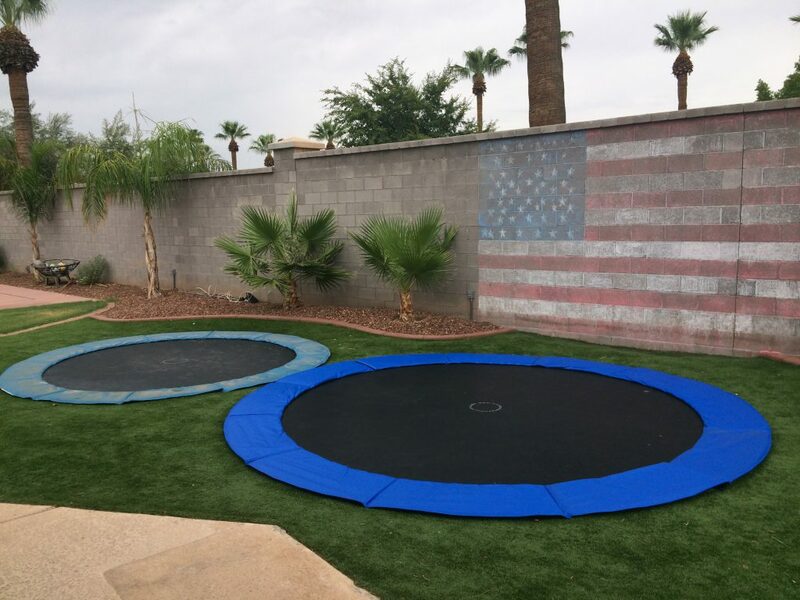 Whether you’re using the trampoline for fun or if your children have been begging for a trampoline or if you want to get in shape in a low impact way, once you’ve invested in your trampoline or in-ground trampoline you may be wondering what else you can get to amp up the fun and safety. In case you’ve ever wondered, it’s believed that Eskimos invented trampolines when they used to jump on a walrus skin. We’re not sure if that’s true, but it is an intriguing tidbit, right? Today’s trampolines have evolved from the “walrus skins” of yesteryear and so have the accessories for your trampoline. Trampoline cover. Invest in a trampoline cover when you invest in the trampoline itself. This will protect the trampoline jump mat from sun, rain, leaves and other dirt and debris. A trampoline cover can protect the cover and keep it viable for a longer time. A bounce board. If you’re a snowboarder or a wakeboarder, you can invest in a bounce board so you can practice your sport without damaging the trampoline’s mat. A ladder. It’s safer to get onto and off of an above ground trampoline by scaling a ladder than by clambering over the side and jumping off when you’re done. Most trampoline ladders don’t require too much assembly and are easy to set up and move away to keep people off the trampoline if you don’t want them on while you’re away. An anchor kit. If you have an above ground trampoline and don’t want it to blow away in a windstorm, an anchor kit will secure your trampoline and protect it and keep in from flying away. A jump bar. This is a stabilizing bar that can go into the ground next to your in-ground trampoline and will give you something to hang onto when you’re getting accustomed to jumping. When you’re making a purchase of a trampoline or in-ground trampoline, ask us what accessories we have or what we can recommend to make your rebounding more fun!